I currently have funding (tuition plus stipend) for two graduate students starting Fall 2018. For every barrel of oil produced in California, ten barrels of saline water are co-produced. Much of this water is disposed of in Class II wastewater injection wells, which are required to place water in saline aquifers or hydrocarbon-bearing reservoirs isolated from usable groundwater. My group uses archived oil and gas well log records from the California Division of Oil, Gas, and Geothermal Resources (DOGGR) to help understand possible migration pathways between these injections zones and usable water. This consists of understanding the tempo and distribution of wastewater injection across the state, mapping fresh and saline water in the subsurface to determine the depth to base of protected water, documenting changes in water chemistry that are due to wastewater injection and enhanced oil recovery, and identifying well integrity issues that could allow vertical transmission of fluids. We are currently concentrating on mapping protected water near oil and gas fields. Our approach is largely based on identifying the best oil and gas geophysical logs in an area of interest, then using petrophysical equations such as Archie's law to calculate aquifer salinity. Current projects have dealt with understanding how Archie's law works in different lithologies (such as shale or diatomite) and how it can be calibrated with measured geochemistry. We are also in initial stages of using machine-learning techniques to map salinity. Future graduate student projects could involve 1) understanding the role of faulting in controlling water salinity, 2) documenting the evolution of water chemistry in aquifers through temporal changes in geophysical log response, or 3) quantifying the role of well integrity problems in allowing vertical transmission. We are funded by the California Oil, Gas, and Groundwater (COGG) Program in the California Water Science Center. You can find more information here. 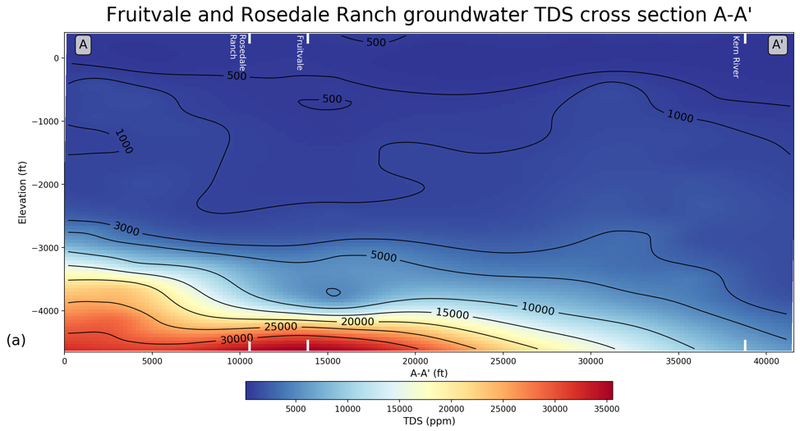 Michael Stephens (MS 2017, now at USGS California Water Science Center) used archived borehole geophysical logs and measured geochemistry to map aquifer salinity structure in the Fruitvale and Rosedale Ranch oilfields near Bakersfield. A key part of this project was determining values for empirical constants in Archie's equation by mathematical optimization based on measured geochemistry. Michael's work explored the role of stratigraphy and faults in controlling deep aquifer salinity. Marissa Loustale (MS 2018, now at California Air Resources Board) used SIMS oxygen-isotope data from late cements in core to estimate groundwater salinity. David Finney (MS 2018) is using borehole geophysics, geochemical analysis, and statistical methods to map 3-dimensional salinity in the San Joaquin Valley. Zack Levinson (MS in progress) is investigating the hydraulic conductivity of faults using borehole geophysical log analysis. Michael Flowers (MS in progress) is investigating historical water injection using borehole geophysical log analysis. Will Chang (Hypergradient) is a data scientist using machine learning techniques to understand water resources. Aren Crandall-Bear (BS 2015, now at University of Nevada, Reno, PhD) documented the distribution and pace of wastewater and enhanced oil recovery injection processes in California (see A visual history of oil field development and wastewater injection in California oil fields). He also began using InSAR to look for the topographic signal of wastewater injection in San Joaquin oil fields.